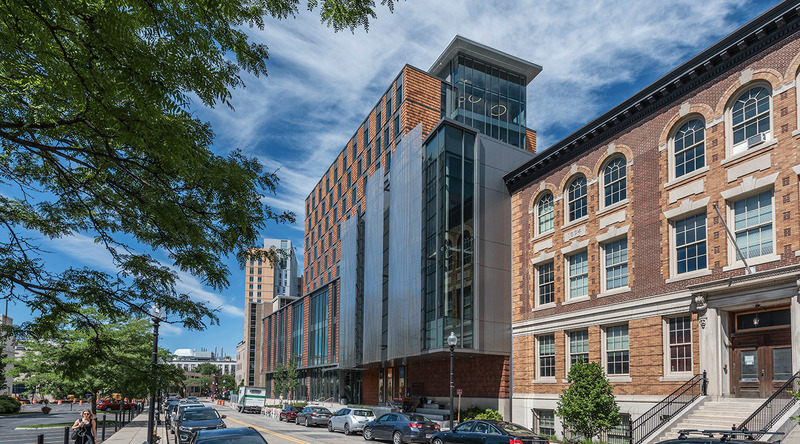 The New England Conservatory, located in Boston, MA, honored its 150th anniversary in 2017 with the opening of the Student Life and Performance Center, a building that needed to provide practice spaces, performance facilities, and student housing all under one roof. It was important that this new building – the first for the Conservatory in 60 years – have a unique identity and express architectural creativity and innovation. 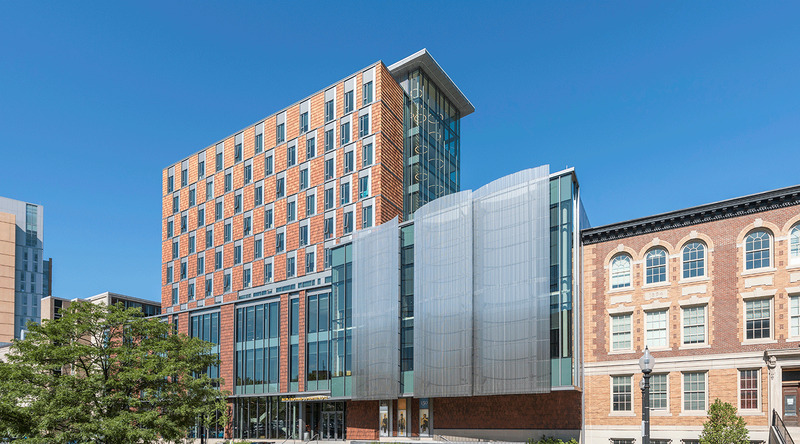 The Student Life and Performance Center holds more than 250 residential units, in addition to orchestra and jazz rehearsal rooms, a black box opera workshop, the New England Conservatory library, 250 student rooms, a dining commons, and spaces for collaboration and gathering. 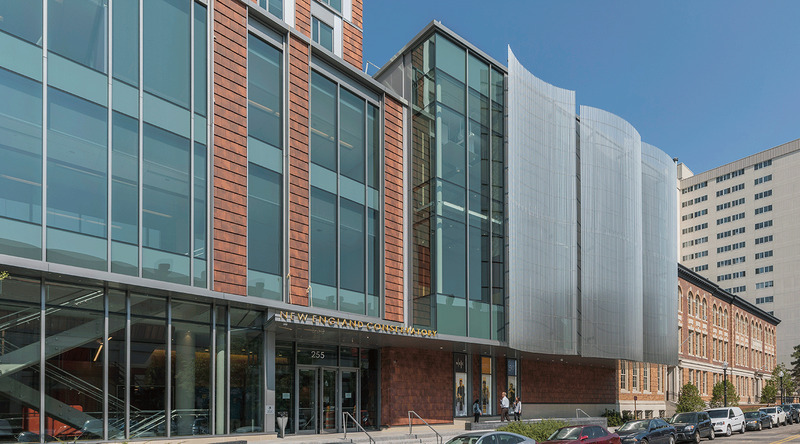 The building’s façade was designed to convey the Conservatory’s commitment to both contemporary thought and tradition. This was achieved with a terra cotta rainscreen, staggered windows, and a 40-foot tall perforated metal screen, which acts as a curtain, allowing for glimpses of the performance spaces and the activity within. 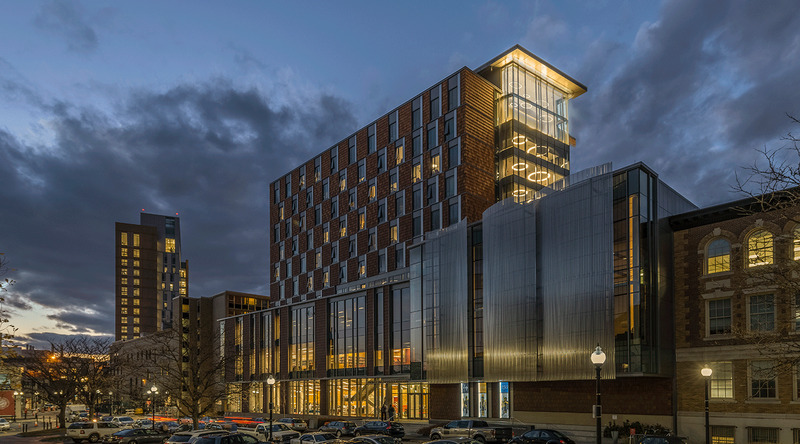 The design team, a collaborative effort between Ann Beha and Gensler, specified CENTRIA’s EcoScreen perforated metal panels in a dynamic Cascade profile to help distinguish the curved form of the exterior performance screen from the rest of the building. Visually, it adds a shimmering, veil-like element to the structure. These panels are constructed through a unique fabrication process that utilizes 20 gauge stainless steel and 0.040" painted aluminum. The result is a 10 - 40 percent open area that provides an airy aesthetic and controls light and air movement, while elegantly blending industrial and other applications with their surroundings. In this application, EcoScreen enables the performance screen to also be functional, as it helps minimize street noise coming into the structure, and allows light to filter into the orchestra rehearsal space. At the penthouse level, additional EcoScreen panels were used to conceal some of the building’s mechanical equipment. 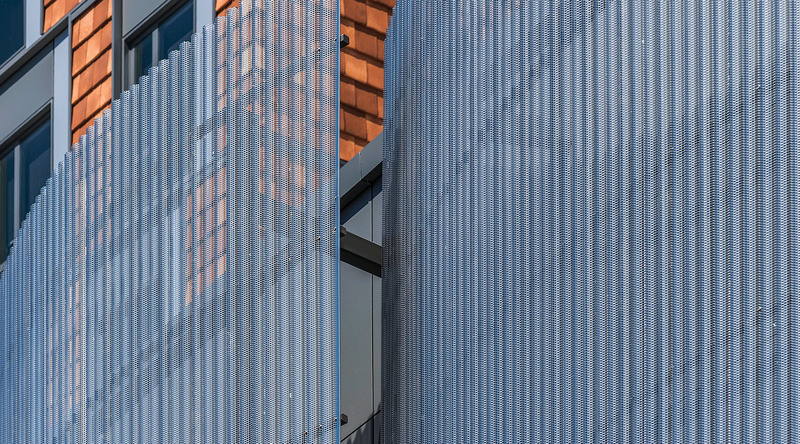 CENTRIA Versawall insulated, lightweight metal panels also clad the building where it faces an inner alley, creating long, sleek lines and providing superior thermal and moisture protection against the elements. “The modular aspect of CENTRIA’s products made the system easy to panelize and install on large surfaces,” Gerrard said. The Student Life and Performance Center is in the process of finalizing its LEED Silver certification. This project marked the fourth team effort between Ann Beha Architects and Gensler. The general contractor was AECOM Tishman, and the installer was Sunrise Erectors.